once a week, especially during winter times. began to study books on how to make it (yep, I’m a control freak!). risotto the stock must be boiling. eat the risotto) and thinly chop it. really vary on what you are going to use. you will need red wine): normally a glass is enough for four people. some exception, but Parmesan it’s always a must. You will need a good saucepan, with a heavy bottom and high edges. You will also need a wooden spoon and a ladle. No more. tablespoons are enough for four people. high heat, briefly, turning constantly. you touch it (about 3 minutes). Add the wine, all at once, and let it evaporate, turning constantly. and then serve it, with extra Parmesan on the side. Ok, and after the basics, the recipe! than add the red wine and let evaporate. Begin to add 4 ladles of stock, and let it boil, turning constantly. then ad more, and so on, until the rice is cooked. Let it stand for 5 minutes and then serve it. Thanks so much for this! This has just won me an argument. 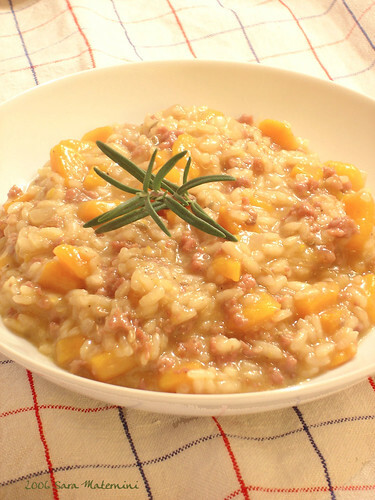 Excellent no fuss guide to excellent risotto! mmm, risotto once a week, I’m jealous! your recipe sounds very good. I made a good risotto the other day, with butternut squash and chicken (first time in awhle. The recipe is here.